Today was a mental busy day, the sun was out the birds were singing and I was bashing and clanking in the garage. I have spent all day and few more hours into the evening doing my upgrade. I have taken out the old leaking master cylinder and replaced it with a new Dual Master cylinder. Yep, last week I went down to see Adam at Mustang Maniac and got myself a new set up. The parts took a little while to find amongst the organised chaos there of the massive delivery of stock. I was a little worried about the fact there was a single cylinder that does all the brakes. If the single cylinder leaks then I lose all braking, not good. So it was a no brainer really to get this in. OK, again it’s not concourse for the car I know all that, but it’s safe or will be once its done. I have taken lots of photo’s for the project and what had to be done, I will upload them and write them up this week sometime, watch this space. All I am saying is I needed more copper pipe, lots of it! Why didn’t I do it yesterday? Simple, remember that rotten ol’ (OK, it’s new but I don’t like it because of the hassle it gives me), summer-house I was having fun with? Well I finished it off yesterday. It was a total nightmare to say the least. The glass was cracked when I opened the packets up and the latch had the bar missing inside to go to the inside handle. Just what I needed, NOT. I put the rest of the glass in that I could and panel pined the beading on. Now to me, hammers and glass don’t go well together and I was so carefull not to break any more glass, hardly ideal. Give me metal to sort out anytime! 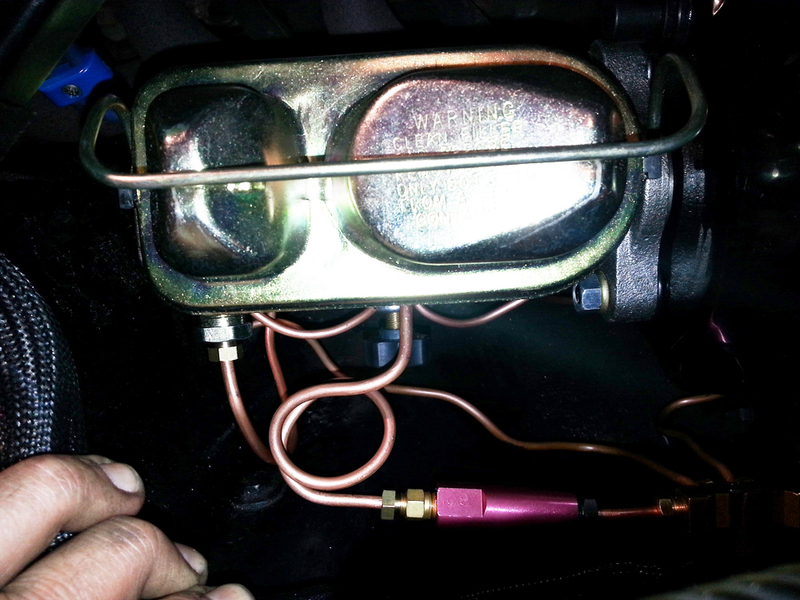 I have attached a picture of the finished Master Cylinder as a little teaser. This entry was posted in General and tagged bank holiday, brakes, copper pipe, dual master cylinder, garage, project, servo, summer house. Bookmark the permalink. I see you are using the copper lines. How do you like them ? May use them on the 65. Nice work by the way! Thanks for the comment. Yeah I was pleased with the results and it does look pretty good once it was all in. The copper pipe is so much easier to get in shape and work with. I have a specific pipe bending tool which you didn’t need with the cooper at all. I would say that you have to be careful not to kink the pipe when bending. I found bending and making smaller in sections is the best way or wrap it around something like a hammer handle etc. The other advantage is the cost of it compared to steel, the fittings and flares. Most DIY tools don’t recommend the double flaring tools are used with the steel pipes, so on the copper its nice and simple to create nice flares and use, (as long as the end of the pipe is squared of nice and deburred). Preformed steel looks good, will fit how it should but is pain to put n place, The copper you can custom route where you want it, which is what I did. I was thinking of spraying the copper to aluminium or something to make it look a little more stock. The extra little coils I have added enable me to straighten them out and re-route if I need to for some reason later on. Would I recommend it? Yep and I would use again if I had too. It was quality time, and should make it safer. I’m pleased with the results. Looks like a well spent Sunday! It was a good Sunday and Sunday evening, The wife called me as it was dark and I hadn’t realised! I got carried away. By the car, or the wife?! 🙂 Just teasing.